When you think of menopause, insomnia, depression, hot flashes, night sweats is what may come to mind. But adding to that now, research has shown that post-menopausal women also have a higher risk of heart disease. Menopause is not a disease by itself but it does dramatically bring up the risk factors associated with heart disease. A decline in the natural hormone estrogen during menopause is the reason for this change. During a woman’s life cycle, estrogen plays a protective role against heart disease in women. This is why traditionally it was believed that men are more prone to heart attacks. However research has shown that post menopause, a significant number of women have suffered heart attacks and other heart-related issues. This is because the level of the hormone estrogen begins declining during menopause. Estrogen has a positive effect on the artery wall and helps to keep the arteries flexible so that they can relax and expand as per blood flow. So reduced estrogen levels make the blood vessels stiff and less elastic. As a result blood pressure may rise, causing a risk to the heart. Estrogen is associated with higher levels of HDL or ‘good cholesterol’ and lower levels of LDL or ‘bad cholesterol’. Declining estrogen levels leads to the opposite, which is higher levels of LDL and lower levels of HDL and also higher levels of triglycerides in the blood all of which lead to heart trouble. Estrogen also prevents white blood cells from adhering to the walls of the blood vessels which can lead to dangerous blocks in the vessels. Lack of estrogen causes this change, thereby increasing the chances of developing heart disease. Hormonal changes during menopause cause a reduction in the metabolic rate in a woman’s body. These changes, without the necessary lifestyle changes lead to weight gain. Estrogen prevents a woman’s body from storing fat around the abdomen and withdrawal of estrogen during menopause changes the distribution of fat towards central obesity and as a result puts more stress to the heart. Menopause is a natural phase in a woman’s life cycle. 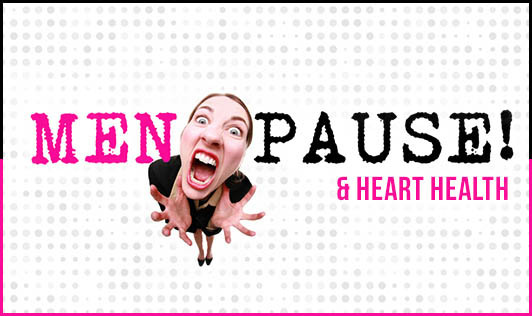 By itself, menopause is not dangerous and will not cause heart disease. However as risk factors increase, lifestyle changes are required to counter-attack them. Heart disease will actually manifest if these natural changes are accompanied by a bad lifestyle like smoking, excess alcohol, and lack of physical activity. So it is not like nothing is in your hands. Don’t blame your hormones but take charge of your body and health. You can prevent a lot of damage by simply making a few diet and lifestyle modifications. The earlier you get on track, easier the menopausal and post-menopausal phase will get. Eat a wholesome meal which includes whole grains, pulses, fruits, vegetable, and low-fat dairy. Exercise daily for at least for 60 minutes. Walking, dancing, and swimming are good aerobic exercises to strengthen the heart. These heart-friendly lifestyle changes will help you to sail through the natural phase of menopause smoothly and keep you fit for your second innings!